The paper describing this new technology breakthrough was published in the October issue of the online journal Biomedical Optics Express (and is available here as a PDF). It represents the work of Dr. Krishnarao Tangella, from Pathology at the UIUC College of Medicine; and Drs. Joonoh Lim, Huafeng Ding, Mustafa Mir, Ruoyu Zhu, and Gabriel Popescu of the UIUC Quantitative Light Imaging Laboratory (QLI). 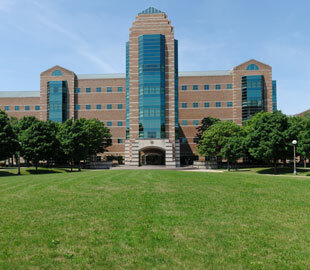 The QLI Lab is described as "performing highly interdisciplinary research at the interface between technology development, basic biological studies and clinical applications" and is hosted by the Department of Electrical and Computer Engineering and The Beckman Institute for Advanced Science and Technology. Building on previous work, these UIUC scientists found that the scattering pattern changed significantly with the diameter and width of the "dimple" of red blood cells. They then were able to calculate the parameters of a healthy red blood cell and differentiate it from a misshapen or unhealthy one. The accomplishment allows them to analyze large groups of cells at once, rather than singly under a microscope, and with a high degree accuracy.